Summer may be over but that doesn’t mean you need to be in a hurry to put the grill away. Nothing helps keep the cool temperatures at bay like cooking over some hot coals. What better way to keep your summer memories alive than grilling some of the seafood you harvested yourself? With hunting season right around the corner or already open for some states it is time to make room for venison, moose, waterfowl or whatever your favorite game meat may be. This means getting rid of the left over fish you may have harvested but did not get a chance to enjoy yet. Don’t worry there is still plenty of time to enjoy your catch while making room for you harvest. Let me give you some tips to make the most of each tip of seafood you may have hanging around. Halibut, Stripped Bass , Flounder – each of these species are known for their white flesh which cooks up light and flakey. Because of their delicate flavor which is generally less “fishy” than many other species very little is needed in terms of seasoning, just a little something to bring out the best of the natural flavors. I prefer to place a pat of butter on each fillet, sprinkle with a little salt/pepper, add a little lemon juice and maybe a piece of fresh dill. 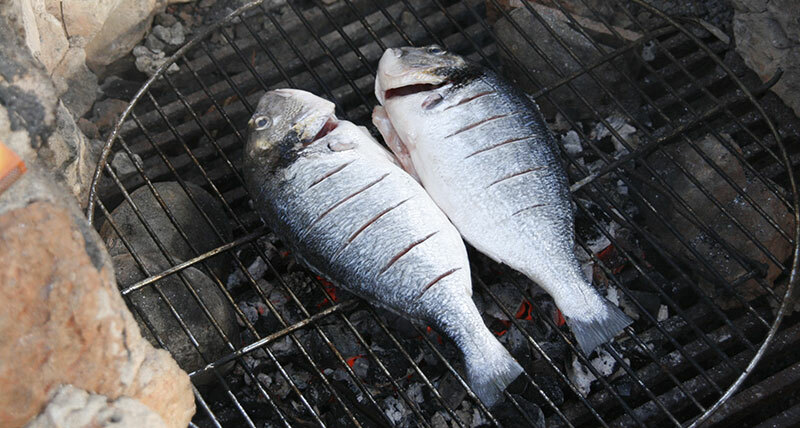 Wrapping in aluminum foil will protect from burning and allow natural juices to marinate the fish as it cooks. Depending on the size of each fillet cook times will be as little as 6-8 minutes, or until the meat easily flakes with a fork. Salmon, trout – these species have a denser, darker flesh and require a little more preparation to achieve the best results. Although I start with the same pat of butter a little brown sugar or honey will help cut the fish flavor. No foil is necessary; these fillets can be placed directly on the grill. Because the meat is heavier cook time needs to be doubles, 10- 20 minutes depending on size. Cooking skin side up will help prevent sticking. Red Snapper, bass – these species can be excellent when cooked on the grill, the problem is getting them off the grill in one piece. Unlike the halibut or flounder you do not want to wrap in foil but you also can not risk placing directly on the grill as they are likely to fall apart- the answer is a grilling basket. Rub each liece with olive oil, sprinkle with salt and fresh garlic, add fresh rosemary and place the basket over direct heat. Cook times are short, only 7-8 minutes, and fish is done when it starts to separate. So fire up the grill, grab your favorite October brew and keep summer alive – even if you are in a hoodie!